endless array of coordination and design. · cuts perfectly on any electronic cutting machine!· no snagging! · textured on one side, smooth on the other! Catch the rainbow with new Doodlebug Textured CardstockTM Assortments - the ideal way to purchase all your favorite shades and tones of our newest Textured CardstockTM line. With 48 single color sheets to choose from, our pre-collated packs make purchasing simple and affordable. In pastel, primary, bright and jewel tones - each assortment pack comes with 48 sheets in 12 coordinated shades; in scrapbook ready 12’’ x 12” or 8-1/2” x 11” sizes. 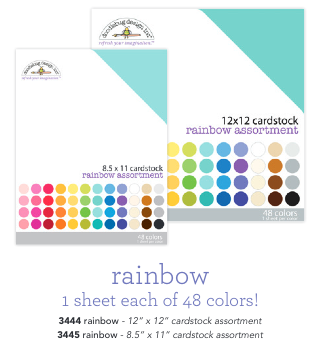 And for the crafter that needs it all, our exclusive Rainbow pack gives you 1 sheet each of all 48 fantastic colors; for endless hours of crafting and fun. Each Doodlebug Textured Cardstock Assortment comes housed in a sturdy, re-useable storage container, perfect for sorting and organizing your collections. We are giving away some amazing boxes filled with an assortment of our new Textured Cardstock SIX lucky winners. The more you enter the more chances you have to win!! You will have until Saturday, Jan. 3rd at midnight MST to enter. We'll post the winner on Sunday, 1/4. Good luck!! I confess ... I am a textured cardstock ADDICT!!! LOVE your rainbow of colours and LOVE that we will have the PERFECT shades for our pretty papers from each collection. The SUPER TALENTED Design Team have also taught me that with some Sprinkles or stickers or Doodle-Pops or Washi Tape, the CREATIVE opportunities are ENDLESS!!! THANK YOU for adding these to your range and for being so practical in considering & including re-usable storage!!! Love these colours!! Pretty much always use textured cardstock!! Cardstock in the yummy Doodlebug colors-perfect! Just love the colors! Following now on Instagram, shared on FB and pinned on Pinterest! i shared today's post. Looking forward to having some textured cardstock that works with my die cutting machine! Love these rainbow colors of you're new card stock! Sure hope I win some!!! Love it! Can't wait to get some! Pinned to my sweepstakes board! Pinterest user name is robindennis. Sure would love to win!!!!! Loving this! Your colors are amazing!! Can't wait to see more! I love the colors of your cardstock! Pinned! Fantastic! That is awesome!! I used a BUNCH of your cs making Huge Volleyballs for my daughter's high school team this year and I NEED some more! Ohhhh, those colours are beautiful!!! These solids will be the perfect compliment to all of the collections! I love the option of having a textured and smooth side! The colors are beautiful, love all of the shades! shared on FB. Love, love the Bright colors! So in love with these colors.... awesome collection! And, I love the idea of smooth on one side, textured on the other.... best of both worlds!!! Loving all the new products! Followed on Instagram, shared on fb, pinned on pintrest! Beautiful! I love the variety of colors. I pinned the bright cardstocks. I pinned the pastel cardstocks. I pinned the primary cardstocks. I pinned the jewel cardstocks. Pinned :) Love these colors!! Can't wait to try some of this paper!!!! I just love the beautiful colors of the cardstock. Off to share on facebook!!! Wahoooo! I so want to try this cardstock! I follow on Instagram. I so want to try this! I LOVE hoarding/collecting paper! Pinned !!! Following on Instagram! This cardstock is fantastic, love the bright cheery colors. I pinned!! Here is the board I specially made for this awesome giveaway! Follower on IG as @jordanbev5 and shared on there for you! I got a Cricut Explore for Christmas and really need your cardstocks to make all my new Doodlebug Layouts with!!! 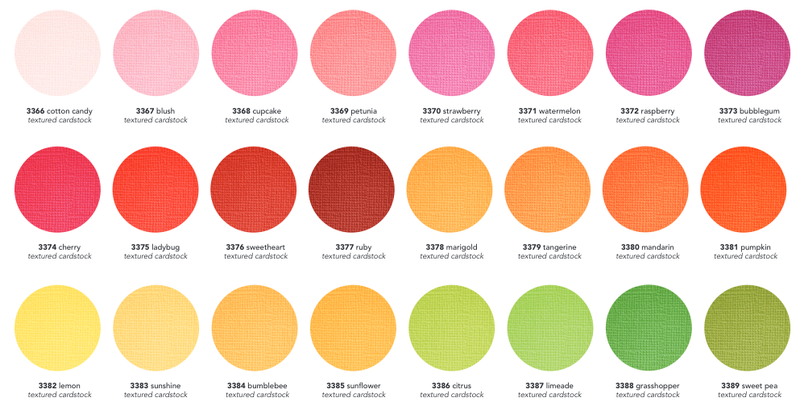 Love all the color choices and especially your range of oranges which I am in love with!!! Hoping to win all of these so I don't have to wait to get them!!! Love all the new colors. I pinned them on my crafts to buy board. I adore these new colors, doodlebug cardstock is amazing, pinned it to my CHA favorites! Following on Instagram. I just ordered Ghouls & Goodies and two other kits. Waiting for them to arrive today. Need the relaxation. Doodlebug makes me happy! Textured cardstock?? From Doodlebug?? YES PLEASE!!!!! Such pretty colors and no snagging. You better believe I pinned this one. Pinned several Doodlebug things on Pinterest before I understood the instructions. But, I'm rootin' tootin' for the new textured paper to go with all my collections! Ordered Lovebug collection when it was pre-order, as I did with Frosty Friends and Friendly Forest . I love your special little characters of every design. Thanks so much for making them and keep them coming. I need it all! Love the colours :) pinned! 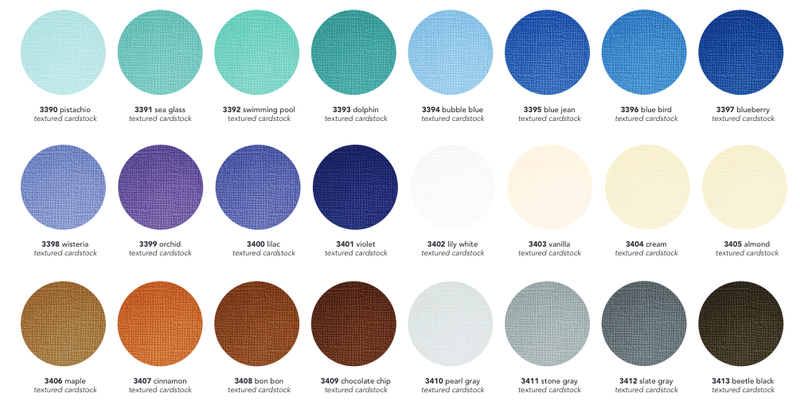 I pinned one image on my "Products I Want" board - because I very much want this cardstock in EVERY colour!!! Love this new produt - thank you! I folow on Instagram (amm181)!!! Liked and shared on Facebook :) Thank you SO MUCH for these awesome giveaways!!! liked and shared on facebook; love all of these colors! I am so very excited about this!!! What a happy thing to happen!!! Thank you for making cardstock in all these beautiful colors!! Love it so much!!!! Shared on facebook - all this wonderful goodness!!!! Love love love it! Pinned it! Shared and followed and pinned. These are beautiful colors!!!! :) Shared!! OOOOHHHHH, AAAAHHHHH!!!! So pretty. Shared and pinned! Such a wonderful idea! Love all of the colors. I love DB card stock! Cuts like a dream. I follow Doodlebug Design on IG!!! Fabulous colors. I am due for new cardstock! Can't wait to get a few packs of the various color packs. I'm a Doodlebug IG follower! Love the colors!